or is she just a miser? The Applebee’s receipt, which was posted earlier this week to Reddit, includes Bell’s handwritten notations referring to an 18 percent tip added to the bill (for groups larger than six). 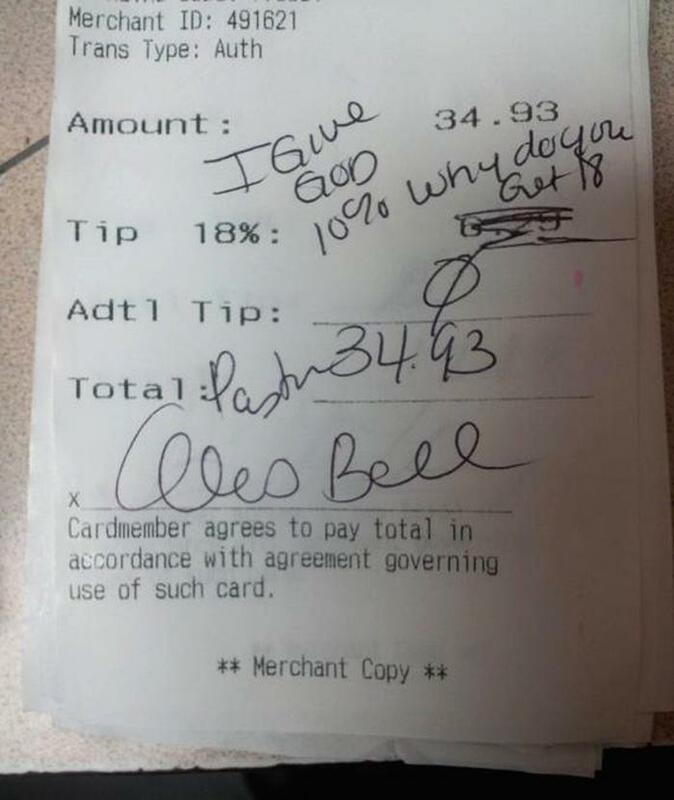 “I give God 10% why do you get 18,” wrote Bell, who scratched out the tip and added a zero in its place. She also wrote the word “Pastor” above her signature. The January 25 meal came after an evening service at the Truth in the Word Deliverance Ministries church, said Bell, who added that five adults and five children were in the group that dined at Applebee’s (a traditional post-service destination for church members). The subsequent bill was divided up amongst the parties. Bell, seen above, said her notation on the receipt was a “lapse in judgment that has been blown out of proportion.” Despite scratching out the tip added to the bill, Bell claimed that she left a $6 tip in cash, adding that she subsequently discovered the 18 percent gratuity had been charged to her credit card. Bell said she learned yesterday that a copy of the receipt was online when a friend called to say she was “all over Yahoo. You went viral!” In response, she called the Applebee’s to complain about the dissemination of her receipt, which includes her easy-to-read signature.